A photographer awaits Gov. 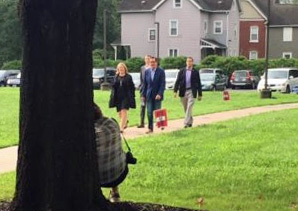 Dannel P. Malloy and First Lady Cathy Malloy at the polls Tuesday. Gov. 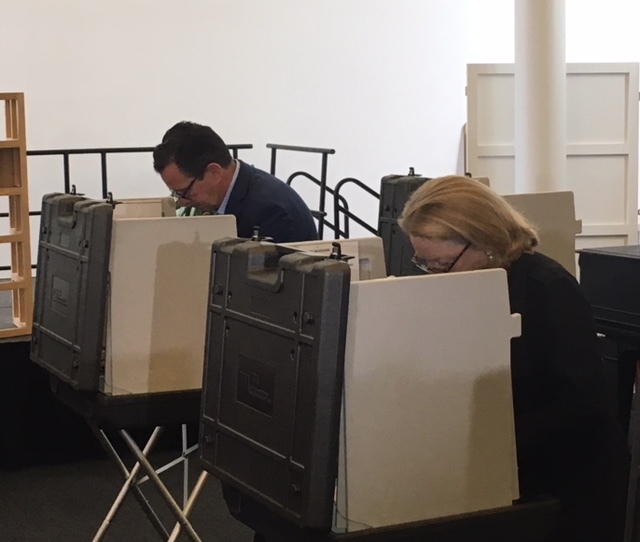 Dannel P. Malloy voted Tuesday in the first Democratic gubernatorial primary since 2002 in which he was not on the ballot, but offered no endorsement of either would-be Democratic successor — an implicit acknowledgement that his unpopularity makes kind words from him a potential liability. But he showed no reticence talking about the unprecedented five-way Republican primary in which every candidate has assured the GOP base of fealty to President Trump, giving the president a grade of A for his job performance and welcoming him to Connecticut for a campaign visit in the fall. Malloy, a two-term governor and former head of the Democratic Governors Association, was making a case that other Democratic candidates up and down the ballot are expected to employ in Connecticut, a state where Trump won only 41 percent of the vote — losing iconic GOP communities such as Greenwich, but scoring in some blue-collar Democratic towns. He said it would be difficult for them to pivot from Trump after the primary. Malloy was not sympathetic when asked about risk Republicans face in a GOP primary if they criticize the president. Malloy, who seems destined to leave office on Jan. 9 as one of the most unpopular governors in the U.S., has been a constant target by the five Republicans: Danbury Mayor Mark Boughton, former Trumbull First Selectman Timothy Herbst, tech entrepreneur Steve Obsitnik of Westport and businessmen Bob Stefanowski of Madison and David Stemerman of Greenwich. Malloy, who lost a Democratic primary in 2006, then won races in 2010 and 2014, arguably took office with little political capital. He won 49.5 percent of the vote in a three-way race in 2010 and never cracked 50 percent in any significant metric of popularity save one: He won re-election in 2014 with 50.8 percent of the vote. Gov. Dannel P. Malloy and his wife, Cathy, cast the 118th and 119th votes at their Hartford polling place at 9 a.m.
For months, the Republican Governors Association has reflexively referred to every Democratic contender as a “Malloy enabler.” The party-endorsed candidate, Ned Lamont of Greenwich, lost a Democratic primary to Malloy in 2010. He is challenged by Bridgeport Mayor Joseph P. Ganim, who is attempting to convince Democratic voters that his seven-year stint in prison on extortion and kickback charges do not render him unelectable in a statewide race. Even so, Malloy would say nothing to indicate an endorsement of Lamont, knowing it would be used against him by the RGA and the GOP nominee. His advice to Tuesday’s winners is simple: Look ahead, not backwards. Malloy, 63, who took office in January 2011 as the first Democratic governor in a generation, inheriting a $3.7 billion budget shortfall, an empty rainy day fund, stagnant economy and critically underfunded pension funds, said he enjoyed being done with the rigors of campaigning and looks forward to end of governing. He leaves his successor with a projected shortfall of $2 billion, partially offset by reserves of nearly $1 billion. In two rounds of concessions, he has negotiated more modest retirement benefits for new employees, but at the cost of a two-year prohibition on layoffs that leaves the next governor with little leverage for further concessions. Under Malloy, the state has made its actuarially required contributions to the state employees pension system, while some of his contemporaries, such as former Gov. Chris Christie of New Jersey, balanced their budgets by deferring billions in pension contributions. But the next governor still will confront massive unfunded pensions liabilities and a nearly empty special transportation fund. Connecticut’s economic growth has lagged most of the U.S. throughout his tenure, though it ranked in the middle of the pack in the most recent quarterly report from the federal government. And while the state’s job growth has been modest, Malloy gently reminded reporters it still reflects a net gain.